Jordan Grumet was born in Evanston, Illinois in 1973. His early childhood was plagued by a learning disability in which, as he described, “letters would dance and jump around the page.” With early recognition and hard work, he overcame this disability and has spent the rest of his career trying to juxtapose words and letters in equally unique and gratifying ways. His interest in medicine formed when his father, an oncologist, died suddenly in the early 1980’s. It was a seminal event in young Jordan’s childhood. Dr Grumet received his bachelor’s degree in science from the University of Michigan where he was elected Phi Beta Kappa. He received his medical degree from Northwestern University in Chicago where he became part of the Alpha Omega Alpha honors society. He finished his training in Internal Medicine at Washington University in St. Louis. He now practices Internal Medicine in Highland Park, Illinois. Jordan is married to his wife Katie and has a son and a daughter. He owns a private practice in Highland Park, Illinois, and he is the acting Medical Director of two nursing facilities. He is an Assistant Professor at The University of Chicago School of Medicine. His poetry has appeared in the The Journal of General Internal Medicine, Annals of Internal Medicine, and The Pharos. It also has been included in anthologies of poetry including Poet Healer (Chip Spann Sutter Press 2004), and On Being A Doctor 3 (Christine Laine and Michael Mccomb ACP 2007). His short stories have been published in Pulse: Voices from the Heart of Medicine and Medical Economics. He is also a frequent contributor to the popular physician web site KevinMD and his medical blog is In My Humble Opinion. Three of his poems appear in the January 2011 issue of Touch: The Journal of Healing. Through my poetry, I try to convey my deep concern for humanity and the miracles I have witnessed as a physician. Each poem I have written is like a letter to my patients, intended to let them know that I've dedicated my life to them and that I care. We immediately recognize humility in another because it is often observed during an extraordinary event when the person displaying this quality has done something dramatic and worthy of recognition but downplays the effect that their actions had on the event. We admire this endearing quality in others whenever we witness it, perhaps because it seems to go against human nature. When a person possesses not only humility but also kindness and innate nurturing, we can’t help but be drawn to them. Nurturing and kindness seem to be innate in people who have chosen paths as healers, those I often refer to as the silent heroes. These qualities often grow from early experiences when a child learns to endure struggles and overcome adversity. When the same is observed in others, there is a sensitivity and empathy for those struggles, and the greater the exposure, the stronger the inclination to hold onto what has been learned as the child grows into adulthood. We see this more often in nurses and to a degree in members of other allied health fields, but unfortunately, we do not often consciously associate these qualities with physicians. There is a tendency to think of physicians as being strong willed and emotionally hardened which reinforces the belief that they are less vulnerable to the human suffering they have witnessed, but I have learned that while this is often the perception, it is not always the case. After working side by side with physicians for thirty-five years, I learned that many had built protective emotional and spiritual shields around themselves. Those who did not were scarred by what they had seen. They were unable to continue practicing medicine, they changed their speciality, or they found some other way to lessen their direct exposure to human suffering. It is rare then to meet a physician who is not only attuned to his role as a healer and able to maintain his perspective on what that role entails but is also able to reveal his humanity. Though I have never met Dr. Jordan Grumet in person, I know that he is just such a physician through our telephone conversations and correspondence, his prolific writing on his and other blogs, and through this collection of poetry, Primary Care. I became aware of Dr. Grumet when we received submissions from him for our journal, Touch: The Journal of Healing, in August of 2010. Two of the poems, “I am the Father” and “Hope,” were selected for publication in the January 2011 issue, and they are also included here. When we received his manuscript of poetry in January 2011, I was hopeful that it contained poetry that was infused with as much compassion as were his submissions to our journal. I was not disappointed. Selected for this collection are seventeen poems from the manuscript that encompass four dominant themes, presented chronologically over the course of the author’s life. As the collection begins, we meet “Jane,” and we learn through the reflective poems, “Degradation” and “Footsteps,” about the trials of the author’s medical education, those who educated him, and the patients who left him with enduring memories. These are followed by poems that speak with a sense of urgency and brutal honesty like “Penance” and “Hope” about crucial moments in a patient’s life. And then there are poems like “Primary .... Care” and “On Call” that describe the personal and emotional toll that can be paid for caring. The collection also includes the incredibly insightful and poignant prose poem, “I Am the Father.” Here we find a patient, his family, and his physician who individually and together struggle to navigate and understand the course that disease and illness has set for them. The manuscript closes as it begins with poems of reflection, but there is more. “When Death Comes,” “Awake,” and “And Yet” also convey the wisdom that has been gained from many years of medical practice. What I find so endearing about these last poems is that they pose many of the same questions that were asked by the student, but we learn that with time there comes an understanding that for some questions, there are no answers. Through Primary Care, Dr. Jordan Grumet reminds us that while all of us, patients, families, and caregivers face the ravages of disease and illness as individuals, we are woven together to form the tapestry of humanity by our common human threads. 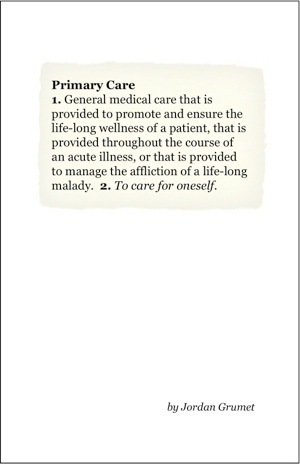 As you read Primary Care, you’ll find that the poems open out into the world. Grumet begins with the physician’s view, but soon shows how lives are interconnected. His poem, “I Am the Father,” explores a terminal illness from the points of view of the father-patient, his wife, his son-caregiver, his estranged daughter, and the doctor who has known him for many years. Only one person is ill, but many are affected by a serious diagnosis. In the poem, “Hope,” he repeats, “There is something we can do,” acknowledging how the doctor and patient become a team as well as how our definition of hope changes with age and circumstance. How gratifying to find a physician who listens, who cares, and who gives us hope through poetry. Jordan Grumet’s view of life is an unusual one. He is a doctor — which isn’t so unusual. He is also a poet. Together, these two roles provide a powerful, extraordinary perspective that was perhaps most recently seen in the work of William Carlos Williams. While Williams rarely wrote directly about his daily medical practice, Grumet gives us a deep, sometimes painful, always unblinking gaze into what life is like on the other end of the stethoscope. Though it isn’t always pretty, it is, in Grumet’s hands, always awesome. Awesome is a word that has gone astray in the hands of our teenagers, but I hope to reclaim it at least temporarily for the purpose of discussing the poems in Primary Care. To be awesome is to generate reverence — which is nearly always accompanied by fear as well as a sense of the sublime. Grumet brings us two main topics — medicine and death, both of which he comes to reverentially. He loves his profession, even though he also feels the terrible distress of it. From the abuse by some teachers of medicine who keep their students late, who critique harshly, who make fun of their questions, who tear them down as seen in the poem “Degradation” to the “welfare line” of patients outside the door of the doctor who feels the numbness of vague symptoms and vague cures in the poem “Discontent,” Grumet doesn’t shy away from the difficulty of the job, the exhaustion of it. Yet he also brings the tenderness of calling his patients by name, as in “Jane,” responds with “a fluttering in my chest or the tears/in my eyes” when a patient dies, who still sees “patients first” after a long, sleepless night of being on call and caring for his own six-week old baby. Grumet brings a soft touch to so many situations that for those of us who only sit on one side of the medical table seem strictly technical. Shortness of breath becomes, in his hands, not the medical term of the poem’s title, “Dyspnea,” but a metaphor for the return to the primordial state, the lungs’ tiny hair’s longing for a return to the lost Atlantis. The doctor waiting for the first patient of the day sits in solitude and thinks about his own imbalance, his own heartaches, his loneliness. And the fact that his hands have been washed so many times, so often bathed in alcohol gel, that they have begun to bleed from dryness and their bleeding becomes penance for the biopsy results he must give. Grumet indeed brings his greatest tenderness to dealing with the death that comes so routinely to his patients — sometimes a terrible visitation, sometimes a blessing. In his lovely prose poem “I Am the Father,” Grumet brings together the points of view of all the members of the family and the doctor, ending with the words of the dying father himself, who, in embracing death as he also did life, finds himself not the loser of the battle but the winner. One can only hope that, as death comes, we have friends, family, our beloved by our side — and, if we are very lucky, a doctor-poet.